In Key Work Driven Framework the script values will be written in Excel files and QTP will execute them using Driver Script. Now this will explain how to execute the script which is specified in Excel Files. There are majorly two approaches followed to make Keyword Driven Framework. Please remember that there is no method is available called “SetParent” in QTP. But I am using this word as a condition to set the parent of the object. I have delimited the Parent Object using “/” and respectively I have used it for properties. To go forward I should have the properties specified in my Object Description Constants. Public Const GoogleBrowser         = "name:=Google"
Public Const GooglePage             = "title:=Google"
Public Const SearchEdit              = "name:=q"
Public Const SearchButton          = "name:=Google Search"
Why do we need to specify object properties as constants? We can specify properties directly in place of constants. But when you get a failure in the script, you might not able to identify where exactly the error occurs. For example, in the above table if the WebEdit step is failed then how do we figure out the failure for which object in the application by just using “name:=q” property. If we have assigned those properties to a constant which is having an understandable name then it will be very easy to identify for which object the failure occurs. 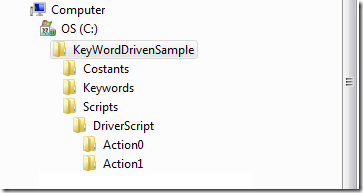 So now we have Excel Keywords and Object Description Constants. We have to write driver script. Follow the below steps prior to write the driver script. Now you can save the below script in Driver Script and Run it. Note: I have given this as a sample. As of now it only works with Test Objects. This is just a sample to explain how keyword driven framework is. It's not developed to use directly in any of the project. it is really good example for keyword driven framework and i worked on it but i did'nt understand if browser name is change(ex:1st browser is google 2nd browser is googlesearch) how can i proceed. so plz reply me i have to get idea on this framework. Its really good i get some idea and if there is any flow diagram or PowerPoint presentation of the keyword driven its really helpful. Please help me in this regard. From Long time I am about to implement Keyword driven framework ...Now By Jesus grace and with thehelp of you ...I completed it. This is wonderful article for beginner. How about the Approach 2 "Write Global Functions for each and every application control and specify those functions as keywords in Excel"? This is wonderful article. Can you please give us sample script for approach 2 that you mentioned above. One can manipulate the script to use for his own project. Good Explanation.It helped me alot.Thank you. I need to undrstand Keyword Driven Framework, Though i understand it theoritically i need to work practically & check.. I know i need to have QTP installed,Create the folder structure mentioned above & copy the script, run it..How do i come to a conclusion that the framework worked? Hi,this is a nice article. I hope we can modify the parameers accordingly and use i in live project..rite? Hi this is nice artile. One doubt I have of using OR constants.vbs, suppose we have 1000 object then we need to create 1000 constant variable which is not a good approch.